Demagogues such as Senator Carl Levin, as well as many other politicians and journalists, often assert that low-tax jurisdictions are havens for dirty money and terrorist financing. From a theoretical perspective, this does not make sense. So-called tax havens have a big incentive to avoid scandal since they are much more vulnerable to reputational risk. Just imagine what would happened, after all, if the 9-11 terrorists had used a bank in the Bahamas instead of a bank in Florida. Critics of low-tax jurisdictions automatically would have assumed that the bank was complicit and the entire financial services industry in the Bahamas would have been crippled – or even destroyed. But because the terrorists used American banks (as well as banks in high-tax European nations and the Middle East), there was not a knee-jerk reaction. People understood that the bank tellers and managers had no way of knowing that the flight school students were actually lunatics. But this does not stop the anti-tax haven smear campaign. Low-tax jurisdictions are viewed as a threat by politicians since it is much harder to impose bad tax policy in a world where tax competition is allowed to flourish. This is why tax havens are attacked whenever something bad happens. If there is a terrorist attack, blame tax havens. If there is a financial crisis, blame tax havens. 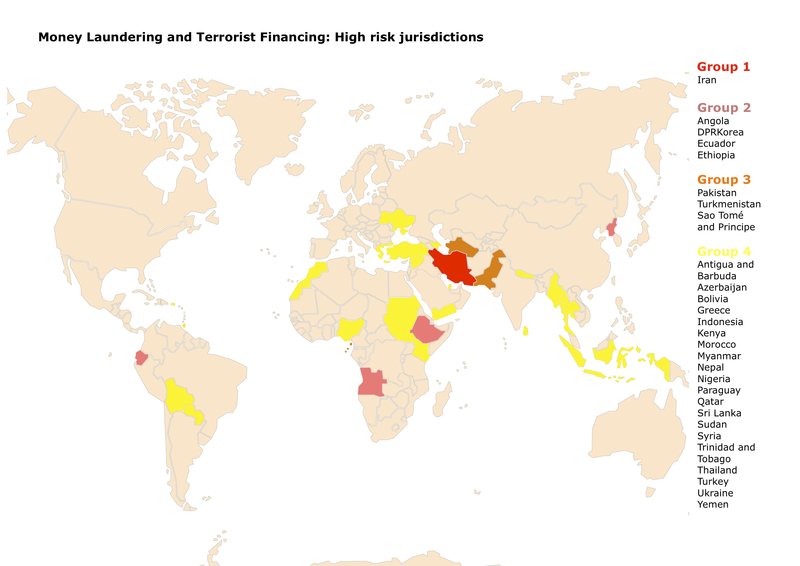 With this in mind, a new report from the University of Basel’s Institute of Governance did some real research and came up with a list of nations where there actually is a high risk of money laundering and terrorist financing. As the map below indicates, only one so-called tax haven is among the 28 countries listed, and that nation was in the lowest-risk category. on April 13, 2013 at 1:00 pm Diez mitos sobre los paraísos fiscales | Verdades que ofenden..
You know, you forgot at least two huge issues when you touched upon FATCA. Senator Levin’s FATCA can also be considered directly responsible for the loss of thousands of US citizens choosing to throw off the burden of remaining a US citizen! The loss of potential tax revenue from just two prominent citizens–Tina Turner and Edwardo Saverin–is likely to cost a considerable amount of money over the course of the rest of their lives. But the biggest loss of all cannot be measured in tax revenue but instead is measured in terms of future potential technological advances. Due to FATCA some of the best and brightest of those among us are seeking to leave the US permanently for places that treat them better. And the saddest irony of all is, in many cases it’s not about the money they pay but the overwhelming monstrosity of the paperwork jungle that compliance has now become for those who live overseas! Don’t even get me started on the monstrous penalties of making a single mistake on tax forms that do not exist in TurboTax or other software, or the added expense of most overseas Americans to comply who often end up paying no tax to the US because of paying even more to their country of residence than they would have paid to the US due to tax treaties. All we have to do to see this brain drain is to look at what Eduardo Saverin is working on post-Facebook . . .
i am amazed that Somalia is not in there – where do the pirates fund their armaments and launder the ransoms ?